The Miller® Millermatic® 252 MIG welder 907321 is a 250 amp, all-in-one MIG welding package that provides a superior arc when welding 22 gauge up to 1/2 in metal. Engineered for performance, the Active Arc Stabilizer provides the most consistent arc starts in its class along with optimum weld performance in all settings. Aluminum welding setup is easy with the direct hookup of the optional Spoolmatic 30A. With Miller's exclusive Auto-Gun-Detect, simply pull the trigger for either gun and you're ready to weld. The Millermatic® 252 features direct plug for XR push-pull gun for professional aluminum wire feed capability. XR-type guns can be directly connected to the Millermatic 252. This allows you to use 12 inch rolls of wire instead of the more expensive 1 lb rolls with the spoolgun. Large, digital front panel with built-in digital timers menu enables operator to preset voltage and wire feed speed. Standard run-in, pre/postflow, burnback, spot/delay (stitch) timer menu. Auto Gun Detect™ allows operator to simply pull trigger on MIG gun, spool gun, or push/pull gun. Automatically detects and recalls the voltage, wire feed speed, and timer of the active gun. Push-Pull Gun Direct Connect - now directly connects your push-pull gun, no extra module required. Angled, dual-gear driven, cast aluminum drive system features no-tool, quick-change reversible drive rolls and an easy-to-set, scaled tension knob. EZ-Access™ Consumable Compartment and Parameter Chart - set weld parameters right the first time with convenient new flip-down compartment that provides fast access to parameter chart and consumables. Less weld cleanup with Active Arc Stabilizer™ patented Miller design provides excellent starts proven superior to the competition. Fan-On-Demand™ cooling system operates only when needed reducing power consumption and contaminants drawn into the machine. Line voltage compensation keeps power constant even if input voltages varies by +/-10%. 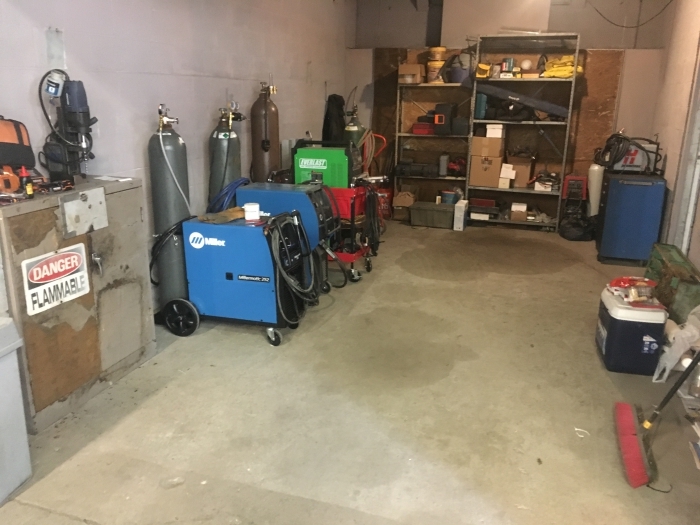 Millermatic 252 MIG Welder 208/230 Volt 907321 would use a Miller Spoolmatic 30A Spoolgun 130831 which can be added at anytime and would be a direct connect. Seeing what this requires, it would not work on my Bobcat 250 would it? The thing is a couple years old. But, continues power is 9500 while the top is 11,000. No.. The auxiliary power rating for the Bobcat 250 is 9500 watts continuous. The Millermatic 252 MIG Welder 907321 requires 9700 watts. Millermatic 252 907321 requires 9700 watts. 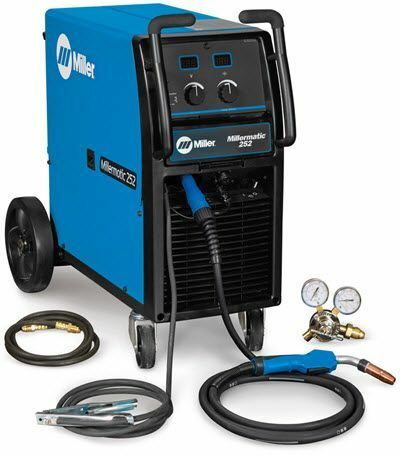 Millermatic 252 MIG Welder 208/230 Volt 907321 can run off the Miller Trailblazer 325 EFI Welder 907754. Millermatic 252 requires 9700 watts. and the Trailblazer 325 EFI supplies 10,500 watts continuous. Can a Spoolmate 150 be used this welder? Is the Millermatic 252 MIG welder made in USA ? What kind of power receptacle do I need to have installed for the miller 252? Have already ordered machine. Im calling an electrician to install and I need to let them know what is needed. Thanks. Millermatic 252 MIG Welder 907321 would need a NEMA 6-50R receptacle. Is this an inverter machine or transformer machine? The Millermatic 252 MIG Welder 907321 is not an inverter based machine. Yes, the python push pull gun will work with your Miller 252 as long as it has a Miller back end. This gun is a MK product and Miller was working with the manufacture to make sure it would work with the Miller 252.
does it include the aluminum spool gun? Millermatic 252 MIG Welder 907321 would need a 50 amp breaker on 230v input. I am looking at the Millermatic 252. In the product information it says it comes with "•15 ft (4.6 m), 250 amp M-25 MIG gun for .030/.035 in wire". Now, when I went to product page for the M25 gun it says the 15FT model is set up for 0.035-0.045 wire if you get the 15ft model. My question is, is the gun that comes with the MillerMatic 252 capable of .045 wire. My assumption is it will but an additional drive roll would need to be purchased for the machine. What size wire do i need to run for the plug for the 252? can i use the option of a push pull gun? Is the 252 an inverter machine? The Millermatic 252 MIG Welder 907321 and all machines that we sell are brand new.. Does the 252 include a flow meter or a regulator? The Millermatic 252 MIG Welder 907321 comes with a flow meter regulator.This style regulator uses gauges not a flow tube. 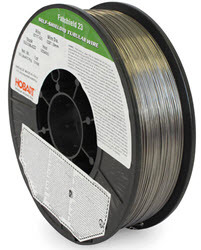 Do I have to have different feed rolls when using flux core vs non flux core wire? Yes.. when you are welding flux cored wire with the Millermatic 252 MIG Welder 907321 you will need to use V Knurled (VK) drive rolls. When welding solid wire you will need the standard V Grooved drive rolls. Can this 252 welder welder be used with a 460V source? can it be plugged into a 460V volt plug if wired correctly ? I have a Miller 252NT Bobcat. Can I plug this unit into it for the power supply.? No.. The auxiliary power rating for the Bobcat 225NT is 9500 watts continuous. The Millermatic 252 MIG Welder 907321 requires 9700 watts. What kind of electrical plug comes installed on the 252? What Electrical receptacle do I need to have installed? If go go with the option that comes with the spool gun and dual rack what is involved with switching from steel to aluminum? Does the spool gun replace the existing mig gun or is there a separate plug? Do you have to unscrew and change the regulater or do both tanks hook and and there is a valve or switch? Millermatic 252 MIG Welder 907321 would need a 50 amp breaker when running at 230v. can the 252 be rigged up to do pules? Do you offer any student pricing promotions? Can the welder operate on 3 phase power? 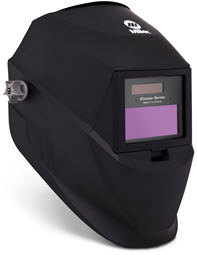 Will you ship a Miller 252 welder pkg to a residential address? Im looking at purchasing a dual cylinder rack as well as two bottles of gas. Millermatic 252 MIG Welder 907321 as well as all items on Cyberweld.com can be shipped to a residential address. What is the difference between Millermatic 252 package 907321 and 951066. What comes with each package? 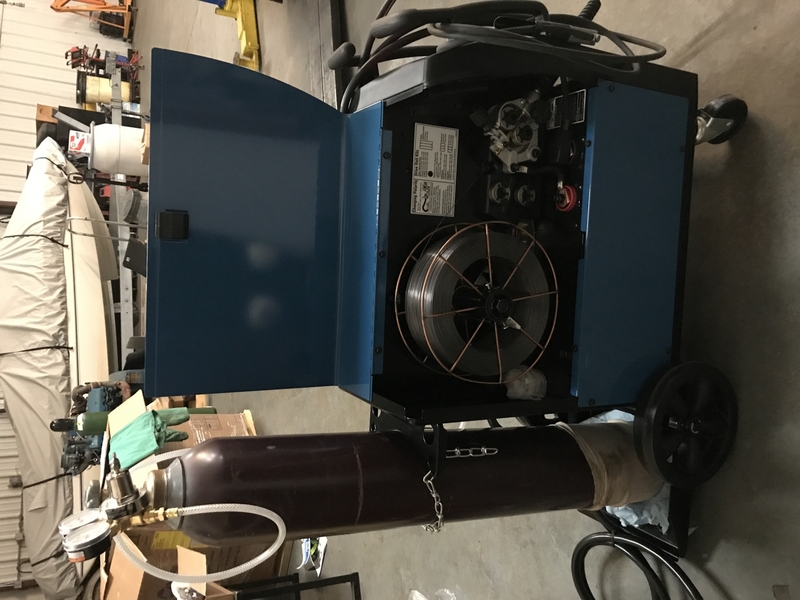 907321 mig welder if i were to buy this machine and later on wanted to hook up a 30A spoolgun would I need to add any special connections to the machine or will the 30A spoolgun be ale to plug right on in and I can switch from mixed gas to argon and be ready to weld aluminum? You would not need any additional items to hook a Spoolmatic 30A gun to a Millermatic 252 MIG Welder 907321.
are these welders new or refurbished ? We have a millermatic 250 in our shop. We have had it since 1998. We have it set up for 460 single phase. Can the millermatic 252 be run on 460 single phase? 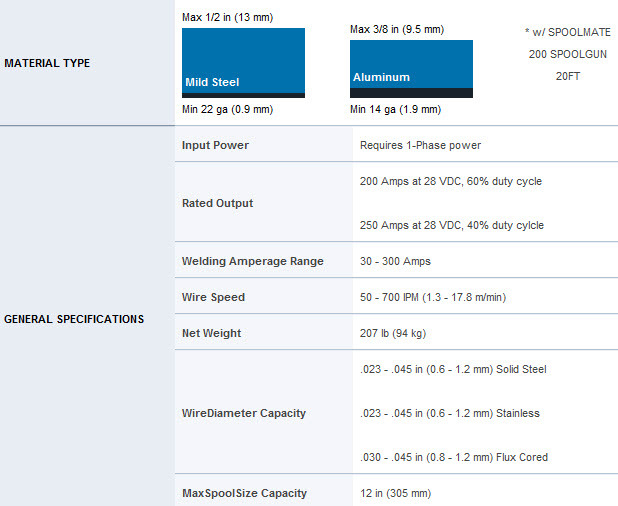 Yes the Millermatic 252 MIG Welder 907321 can run on 460 single phase. Consthere really isint any just getting use to it. So far I am very very happy with its performance, and especially how quiet it is. Not enough reviews stress how quiet it is, to me its very important . Would have bought this a long time ago if I had known that. Service from Cyberweld was excellent, everything arrived on time and intact. Consshort ground leads, miller you can do better . charge another $10.00 and add 5 feet more ? A great machine,what else can i say! ConsI'm just not 100% with the plastic snap shut chart/parts drawer.Just feels cheap. Great machine, I've had a Miller 35 and a Miller 200, they were both great machines but the 252 beats them both. I also changed the ground clamp from the jumper cable style end to a Tweco copper clamp and put a 15 ' ground wire on it. I like to keep the gun stretched out and with a 10 foot ground cable you got 5 foot of gun cable that gets in the way, twisted or bunched up. Could have dealed with it better if the gun would have been 12 foot. ConsPoor ground clamp....poor ground equals bad weld. Ground cable should longer. Cyber weld does a great job with customer service. They are well experienced in this field. ProsThey did my rebate over the phone. That saved me time and stress. ConsMy crate came damaged but I signed for the package anyway. My costumers have been waiting on their boats to be fixed and built. ONE OF THE BEST WELDERS I'VE EVER USED AND I LOVE DEALING WITH THESE PEOPLE. EVERY TIME I CALL I GET A REAL PERSON AND THAT'S JUST ABOUT UNHEARD OF ANYMORE. THIS IS THE SECOND WELDER I'VE PURCHASED FROM THEM AND BOTH OF THEM SHIPPED QUICK AND GOT HERE IN PERFECT CONDITION. YOU CAN BET THE NEXT WELDER I NEED WILL COME FROM HERE AS WELL. THANKS FOR THE GREAT SERVICE. My Miller welder arrived on time with everything as advertised. I highly recommend Cyberweld and would buy again with no regrets. ProsFast and easy purchase with a good price . Nobody could come close to beating Cyberweld's price, no shipping and no tax! They contacted me the day after purchase to confirm and scheduled delivery. The customer service was very courteous and helpful. I'm real happy with my purchase. The welder does everything the way it should and seems to be of high quality. ProsPriced right. welds nice and smooth, and I like the fan on demand so you don't have to listen the fan run continuous. I have always had Miller welders and have always been happy with them. I am a hobby welder, mostly making furniture and decorative things out of steel. I upgraded from a Hobart 140 Handler to the Millermatic 252. What an amazing difference! I can now weld like a professional, with a perfect joint every time. I cut my grinding time by 80%. I had a Miller 250x with a 30a spool gun for 20 years and welded with it countless hours and to this day still operates as it should. I decided to up grade to the 252 and a 30a pro gun, and I'm just as pleased with my purchase. Cyberweld is a great company to work with and I would highly recommend them to anybody looking to purchase a welder or supplies. Best welder ever!!! Highly recommend to anyone. I absolutely love it. Great machine! It roles awesome. Nice heavy duty cycle. I use 0.45 wire and 75 % argon and 25 % co2 mixed gas. Pretty quick shipping. Beat competitors on pricing. This machine works flawlessly right out of the box. Not much to set up. I strongly recommend it for any serious welding. When talking to the owner of a local welding shop, he told me that if it wasn't a Miller it wasn't a welder. I've had a cheap Century for a few years and never could do very well with it. Set up the new 252 and laid down a beautiful weld the first time pulling the trigger after setting the heat and wire speed by the chart. Bought it for a big project, and it's awesome! ConsThe ONLY negative is the tray that flips down on the front of the welder that holds the consumables. It's a little hard to open, and I'm afraid it might not hold up as well as it should being made of plastic. It will weld itself. I can put anyone behind the trigger and they can lay a beautiful bead. And they can't even weld. Welder came around 4 days after I ordered it. Best pricing around by far! Great customer service, I received a call when my order was shipped from A REAL PERSON not a machine/recording.. Welder came nicely packaged also. Will definitely buy another welder from here. This is a one stop shop. 5 stars!!! Have used miller welders on our process line for many years have never let me down! Good job miller! I've used a fair variety of Miller welders and own 3 so far. The mm252 welds as good as my mm350p without the bells and whistles. If you do production type fabrication I'd even recommend this machine. Cyberweld's prices are the best I've seen them and the shipping is super quick. 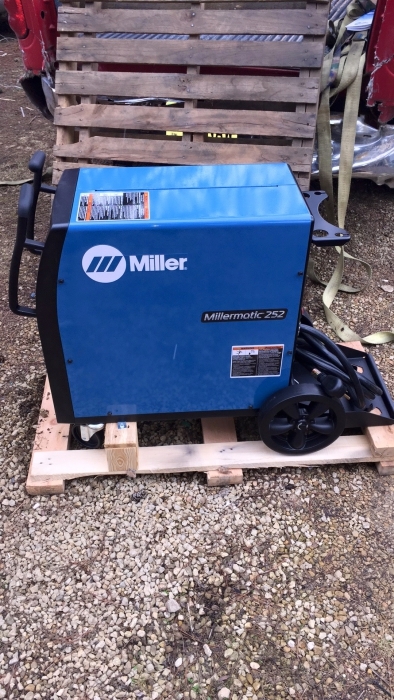 The Millermatic 252 is a nice welder in a fairly compact unit, easy to set up, runs very smooth, very happy with purchase. I would say Cyberweld is the only place to buy from online, best service, best price, fast shipping, will buy again from this company, Thank You. Front plastic cover would be great if it was made out of metal but what can you do, the 252 is out standing. I have done many projects with this welder and it is an excellent machine. Great for beginners, DIY, and Pros. Very easy to use and you can fine tune the settings to suit your needs. I've welded 3/16"- 1/2" thick material with no problems. I did change the gun out as soon as I got it with a TWECO Classic 400 amp and bought a cover for it. ConsNeeds to come with a 400 amp gun and cover. parts tray isn't the greatest. I absolutely love this machine. It honestly might be overkill for my needs but I'm happy with that. I was considering the Hobart 230 ironman but when I did my homework I found a lot shops run the 252 and even though the Millermatic was the more expensive machine I bought it. ConsThe consumables tray that flips down in front seems really cheap and I feel over time could break or no longer latch. Nice welder, same week delivery! As with most Miller machines I have used, this machine welds fantastically! However, I'm pretty dissatisfied with the feel of the control knobs for voltage and wire speed adjustment. They feel extremely cheap, and I really do NOT like having to roll the knobs around and around and around to make large adjustments in wire speed! Bad design in my opinion. The consumables tray in the front also feels like it will likely break in the near future...another lousy design. Still performs flawlessly though. I used the Millermatic 252 in welding school and bought one immediately after I finished the program. I then used it for 3 years with very few problems (replaced hose liner and several tips - nothing out of the ordinary). When someone offered to buy this machine, I replaced it with another 252 without any hesitation. It makes amazing welds and is incredibly user friendly. I often let friends with no welding experience use it just to see what it's capable of, and even they catch on quickly. Their service is second to none. I messed up my order and they were great to work with. no surprises, it does what it is supposed to do. in todays world that is amazing. Easy to set welds smoothly . fine welder. Excellent machine. Welds thin sheet metal with ease all the way up to the heavy stuff. Cannot say enough good things about it. Great machine, great service. Got a phone call about the shipping details from cyberweld and then a phone call from the shipping company to set up a delivery. I am very pleased. Simply does a great job! This machine is stone simple to tune and welds beautifully. Great Welder & great price!! Purchased this welder last week and have already run it through its paces. I could not be more pleased. Best of all was the FAST delivery and it arrived in mint condition. In my opinion, Cyberweld is King! Best prices, fast delivery, good website and super customer service. This is my 2nd. welder purchase from them (Dynasty 200dx) and also a 5 star rating. They are a very friendly company who cares about their customers. i am very happy with my new welder. showed up on a skid and was packaged very well. couldnt have had a better experince. The Millermatic 252 is a really excellent MIG unit. It's well-built and has all the power that you will need for anything up to 1/2" steel. I was very pleased with the price and excellent shipping that Cyberweld provided for my unit. It came without a scratch and very promptly. Thanks! ProsSolid wire drive,. great power capacity and nice controls with good firmware settings. . I have purchased a few big ticket items at cyberweld, and would recommend them to anyone. FREE lift gate shipping, and fast!